I’ll be honest… Minecraft is really not my thing. There is something about the playing style of Minecraft that annoys me. I think it is that fact it can seemingly go on forever, or maybe that it feels like you are designing the game as you play. My preference has always been games that have an end or purpose, though there are a few exceptions. 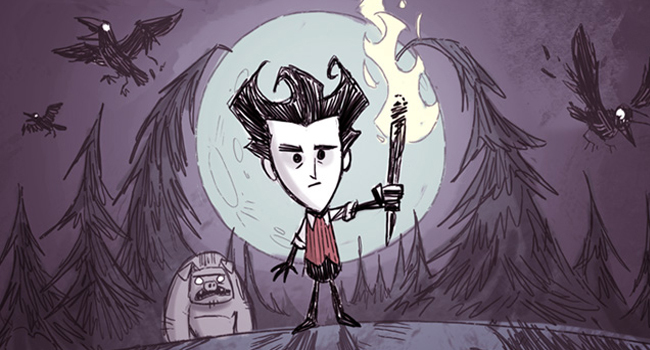 With that in mind, recently I dove into the game aptly named Don’t Starve, expecting to hate it. I had seen trailers of Don’t Starve and while extremely unique in its art style, I expected it to be a Minecraft clone. It most certainly is not, but the game does dip its toe in that water a bit. In a way most developers try to do with naming but fail, Don’t Starve is the whole point of the game, not just a title. Wilson, the game’s first of many protagonists, is a scientist dropped into a dark world by a demon. The demon’s only words to you are “You don’t look so well. You better find some food before it gets dark.” Why are you there? What’s going on? He doesn’t really say, and I think that is half the fun. As Wilson’s now alone in a bizarre frightening place reminiscent of something out of Beatlejuice, you wander around picking berries, collecting rocks, and sticks. From these items, you can create tools to help you to cut down trees, break boulders, and dig up plants. This game is very crafting heavy, but does it very well. Besides looking for food and tool making, the night cycle is your real challenge. Once night comes, if you do not have enough wood to build some kind of fire, it is game over. A nice fire every night keeps the monsters at bay, and doubles as a way to cook your food. Don’t Starve is challenging at every turn. You only get one life, which make it even more challenging. That shouldn’t scare you away though; as you play and learn to build new tools their blue prints stay with you every time you die. After each death you receive Experience Points that allow you to unlock new playable protagonists like Willow the Pyro or Spoiled Rotten the Robot. It also helps that the worlds are randomly generated too. Get bored of an area or find it too hard? Just die and select the create new world option. There seems to be an unlimited amount of things to see and do. I’ll be honest and say I am not sure at this point that Don’t Starve has an ending. Technically, it’s really still in Beta and the full version does not come out until March. Despite being a beta, it seems to be a very complete game and Klei Entertainment, the developer of this interesting title, patches it once or twice a week. You can buy it on Steam and the Chrome stores for about $12. On top of that, the game also comes with two copies, making it a no brainer. If you are looking for some decent gameplay footage of Don’t Starve then checkout Frogpats TV Episode 2, located here.